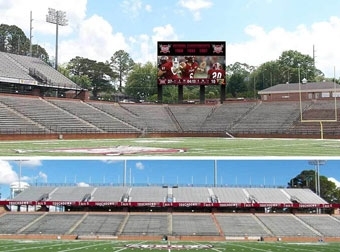 Daktronics Inc. of Brookings, S.D., has struck a deal with Troy University to design, manufacture, and install a new display and audio system in Veterans Memorial Stadium that will feature one main video and audio, two ribbon displays, and two marquee displays outside the stadium. 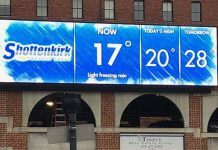 This new main video display and marquee displays will replace the Trojans previous displays that were also completed by Daktronics ten years ago. Installation is tentatively scheduled for mid to late summer. When the Trojans return to the gridiron this fall they will be pleased with the stunning updates in Veterans Memorial Stadium. The main display that is being installed will measure approximately 23 feet high-by-54 feet wide and will incorporate a 15HD pixel layout. This display will provide excellent image clarity and contrast with wide angle visibility while providing multiple levels of protection from the elements. It will be capable of showing one large image to highlight live video and instant replays. It can also be divided into separate windows to show a variety of vivid graphics, colorful animations, up-to-the-minute statistics, scoring information and sponsor advertisements. The two ribbon displays that the Trojans have opted for will provide the opportunity to showcase sponsors throughout events and also provide up-to-the-minute statistics and game information. Both ribbon displays will measure approximately 2.5 feet high-by-300 feet wide and will feature a 20 millimeter line spacing. In addition to the displays being installed inside the stadium the Trojans are also installing two upgraded marquee displays on the existing sign located on Hwy 231. These displays will be utilized for advertising space, promoting upcoming sporting events and for relaying campus events and information. Both displays will incorporate a 16 millimeter line spacing and will measure approximately 6.5 feet high-by-16 feet wide. To complete the installation the Trojans have also decided to have a custom audio system installed, which will be integrated with the video and scoring system. The system will provide full-range sound reproduction and will deliver clear and intelligible speech. This system will provide a powerful audio experience for the fans. 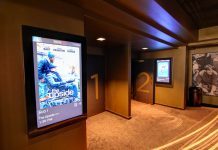 Daktronics audio offers high-quality audio systems that can integrate with dynamic displays in both indoor and outdoor sport venues.